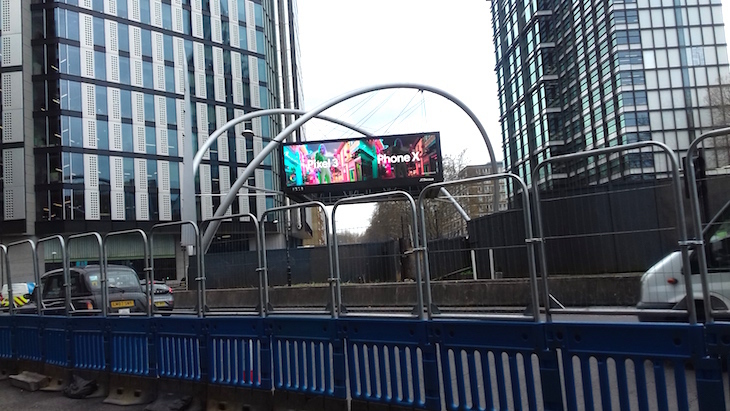 Since four shortlisted designs were announced in March 2018, it's all gone pretty quiet on the massive redevelopment of Old Street Roundabout. But things are due to ramp up a notch tomorrow (20 March), when Phase B — the advanced highway works — begins. The minimal changes we've seen so far are the December 2018 closure of The Magic Roundabout, the bar and club venue located in the middle of the roundabout, and a bit of digging on Cowper Street, to the south east of the roundabout. 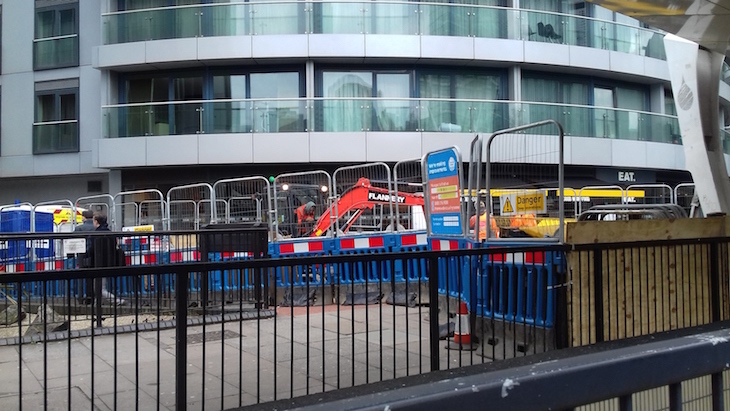 The digging work allowed utility works in the area to be relocated to make way for a new entrance to Old Street station on Cowper Street. Cowper Street is now closed to pedestrians at the roundabout end (by EAT) until November 2019 to allow work on building that new entrance to begin. One lane of traffic has been removed on the southeast stretch of the roundabout, and fenced off to create a safe passage for pedestrians to pass through the works. This week's next phase of work will see the removal of the traffic islands from all four arms of the roundabout — so if you're walking through the area, best use the subways to cross the road. Bus stops in the area may be temporarily relocated while these works take place too, so do check if you normally catch a bus in the area. Phase B wraps up in late May, when Phase C begins — and that's the biggie. 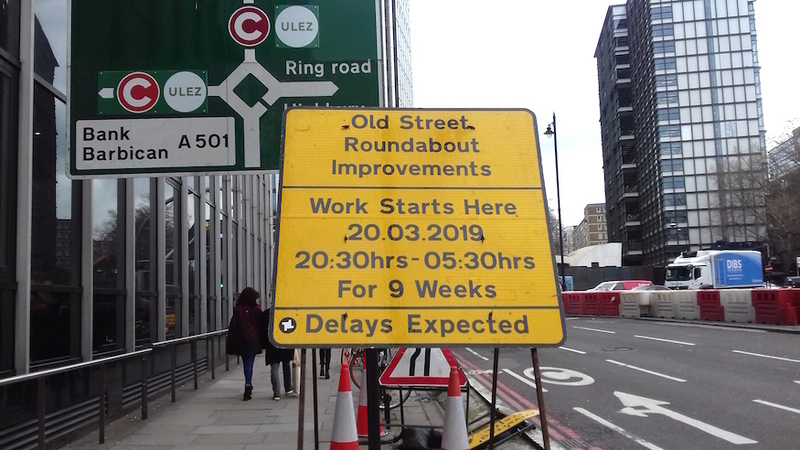 The southeastern section of the roundabout (again, that's the corner near Cowper Street) closes to traffic from 24 May, to allow for construction of that new entrance. Two-way traffic will flow around the rest of the junction, and dedicated cyclist and pedestrian routes will be created through the works. Ultimately, the junction will no longer be a roundabout at all — the northwestern section will become pedestrianised, and two-way traffic will replace the current roundabout traffic flow. Three of the four existing entrances to the station will be removed — the Cowper Street entrance will replace the four existing subway entrances, and a main entrance will be built above ground in the new pedestrianised area. We've not yet got an expected finish date for the work. So what will the final design look like? That's still being kept under wraps — we've never had confirmation that one of those four shortlisted designs will actually be used — and the images have since been removed from Islington Council's website, as has the shortlist announcement, suggesting that there's now a new plan. 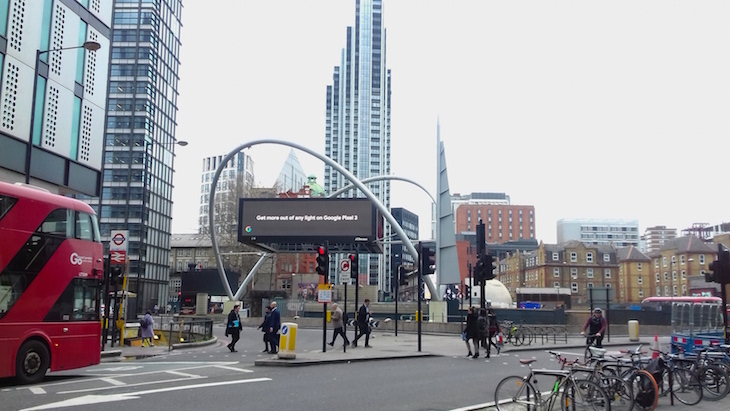 Additionally, recently-announced plans to limit traffic using Old Street have been tied to the roundabout redesign, so the final design may hinge on that going ahead. According to Islington Council, "work is continuing to develop a design for an 'Iconic Gateway'" — watch this space. TfL is warning of possible road traffic delays through the area throughout the duration of the work. For further information on upcoming works, see the TfL website.